The Loan National school was built from local funds and opened in 1834. Conveniently situated at a cross roads, the school was a low building of dark stone and lime, with a door in the middle of the wall which fronted the county road. The windows were small, with nine small panes each. Inside the door was a porch, about five feet square, where coats were hung, many to a peg, for space was at a premium. From this porch a door opened to the left into the master’s room, and from there another door in the dividing wall opened into the mistress’s room. It was from here that the master could exercise an all-seeing eye on the comings and goings of all the children. Furniture consisted of four long desks, ten feet long or so, varying in height to suit pupils of different sizes, a few forms without backs, a cupboard for books, a teacher’s desk and high stool and, of course, a blackboard and easel. At the front of the Master’s room was a large fireplace where, in winter, coal was burned, occasionally peat, while the other room had a stove, because senior girls had to have lessons on cookery and laundry once weekly in winter. 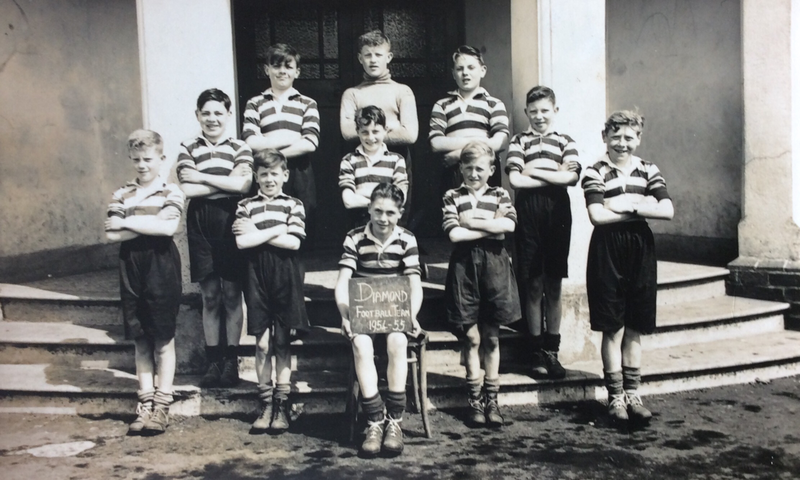 Principals of the school included Master Dunlop, Mr H. B. Porter, Mr J.K. Forbes and Miss J. Humphreys. 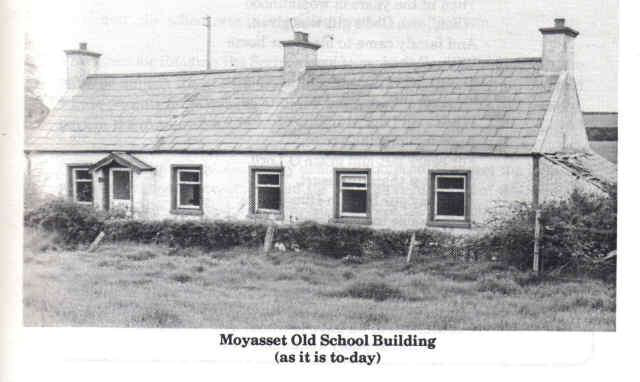 The school at Moyasset was built in 1824 from local funds, and opened in the following year. 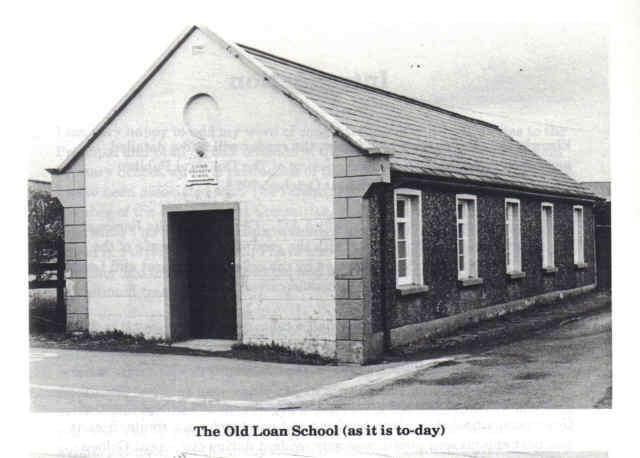 It received National School status in 1840, when an application was forwarded to the Commissioners of Education in Dublin, requesting financial aid towards payment of teachers’ salary, and for supply of books. The building itself was of stone and lime, 26 feet long, 16 feet wide, and 9 feet high in the side wall, with a slated roof. The one-roomed apartment was filled with desks and seats to accommodate 90 or 100 children. A teacher’s desk and press for holding the school books completed the school furnishings. The teacher in that year (1840) was Mr. Wm. Gray, aged 31 years. The average school attendance was 44; 23 males and 21 females. 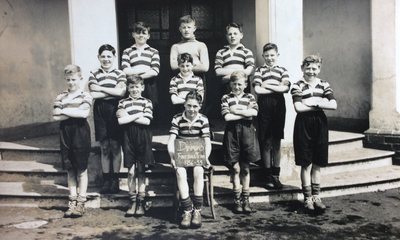 Principals of the school included Mr. W.J. Kernohan and Mr D.A. Porter. 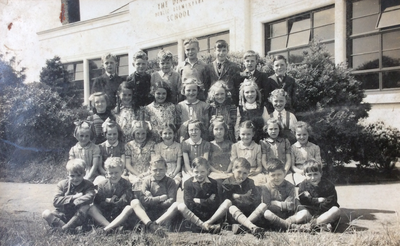 The official opening of The Diamond Public Elementary School took place on Monday 30th October 1938. The ceremony was performed by Mrs M.W. Patrick, Duneoin, Glarryford, in the presence of a large gathering. 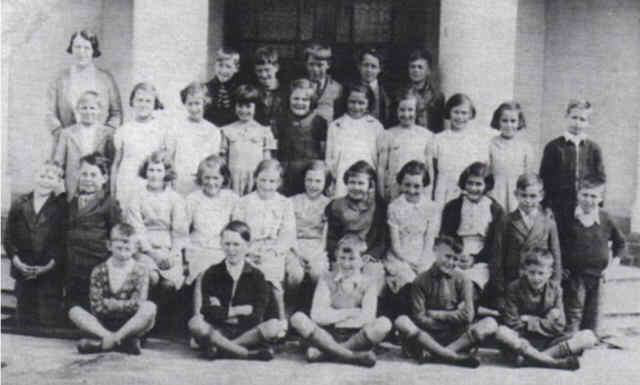 The new school was planned to accommodate 144 pupils, and was built on modern lines, conforming to the Ministry of Education’s requirements. 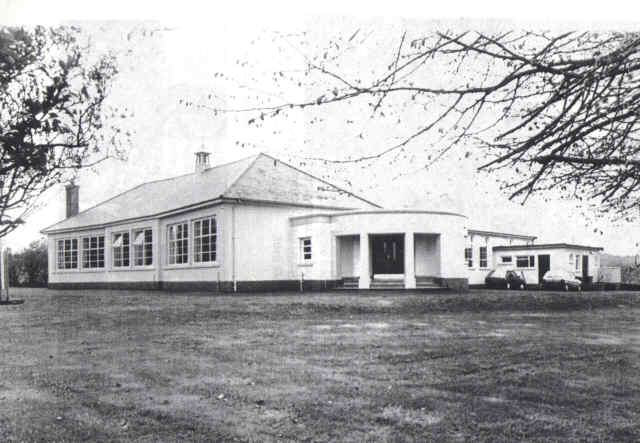 The main block consisted of a one-storey building with three classrooms with connecting corridor 8ft wide. One of the classrooms was used for cookery and had a cooking range installed and scullery attached with wash-hand basin, etc. The cloakrooms and entrance at either end of the main block were circular in plan and were flat-roofed with reinforced concrete and asphalt. Each cloakroom was fitted with the necessary number of hat and cloak hooks, wash-hand basins etc. The heating and fuel rooms were placed centrally at back of corridor, and above them is the Principal’s room. Externally the walls were finished in ivory snowcrete, rough-dashed, with red brick base and dressings of artificial stone. The pitched roofs were covered with green-grey slates. The windows throughout were steel in wooden frames with ample opening sashes for through ventilation. Internally the walls and ceilings were finished with hard-wall plaster, painted in pleasing shades with water-paint. Each room was coloured differently. The area between road and school was well laid out in flowering shrubs and grass lawns. The main frontage of the site had a neat gateway entrance, consisting of ornamental wrought-iron gates hung to red brick pillars, with two curved wing walls in red brick and dressings, with wrought-iron railings to match gates. The heating is by low pressure hot water, operated by a furnace situated in a heating chamber below floor level. A well has been sunk in the grounds, and the water is pumped by a force pump to a large tank situated in the roof space. The building was designed and supervised by James Scott, Esq., B.E. architect to the Ballymena Regional Education Committee. The clerk of works was Mr. S. McTurk, C.E. also employed by the Regional Education Committee.